This is what's happening... I want to post Toulon Part Deux, and show you what happened with Brother-in-Law, the office chair, and the Hello Kitty mask, but I'm waiting for Mr. London to send me something that is absolutely vital to the post (trust me on this one), and as soon as Mrs. London can get him to stop playing Candy Crush, he will (I'm being patient with Mr. London since he had such a horrible rugby weekend. Actually, it wasn't only Toulon, all of my teams had a disastrous time of it; Clermont, France, Ireland... the world basically turned upside down and I'm not happy about it). So in the meantime (and as we patiently await a Candy Crush break), here are some photos of Le Petit Village after it snowed buckets yesterday (It was still snowing loads when I took these. I'd like to think that they would have been better if the snow hadn't been pelting my face and soaking my camera, but I doubt it). And then we passed a house and Fifty decided to get a little nosy. I think I might start calling him Gladys Kravitz (up top if you get that reference). Look at his right ear trying to tune in on the juicy gossip like a little antenna. He's such a weirdo. I even took him off his leash (he HATES the leash) as we were leaving the village but he would just plop himself down and stare back at the house. I think he was hoping that someone would come out and invite him in for tea (either that or something horrible has happened in that house and he's sensing it... but I'm going to go with the tea invite, yes, he was definitely waiting for an invitation to tea). Can you spot Fifty in this photo? He was hiding from me. I didn't think it was very funny because I was sure that he would go a little too far into the wood, slip, fall and tumble down the hill and I would have to find a way to rescue him (Fifty has a habit of getting himself in precarious situations and has to be rescued; like stuck out on the roof, or a window ledge. He's nothing but a damsel in distress really). what type(s) of dog would you say Fifty is? For Fifty, hard to say! Mixed breeds can look so different from the originals, we had a mix of Belgian shepherd and street dog with unknown breeds(liked like a huge cow) and or dog was like a Belgian without the wispy hair. Rest of the litter were all different colors and type of hair. Fifty always makes me think of a bulldog - not his face, of course, but his build and colouring. There are lots of French breeds I don't know tho, so I'm sure I'm missing something fundamental. The snow is always beautiful from inside a cosy house and when you don't have to shovel it away from the doors or off footpaths. We have a thick blanket of snow over our house in France and the roof hasn't been repaired! Fingers crossed that the damage to the interior will be minimal. Warm regards. I'm so jealous of the snow! Lyon has none, it falls from the sky and disappears at some point in between the sky and the ground because there is nothing out there now :( My one winter in Lyon, I was really hoping for snow! Perhaps I'll have to venture beyond the city limits... I hear there is lots. Fifty looks like he is part shepherd , maybe some kind of mastiff. I think the DNA is a great idea .. some breeds have health issues and the test would let you know what to keep an eye out for or what to do differently . He is lovely , whatever he is .. so is the snow. I have not seen snow in over 7-8 years, I am moving back to the US ... where it snows. yay ! Oh it is so beautiful! So.....hot chocolate?????? wow this is gorgeous and I love the dog! Fifty is an awesome dog that enjoys life to the fullest because mommy dotes on him. That snow is amazing. I am always fascinated by the war memorials and that there are always many more names listed for WWI than for WWII. Enjoy the snow while it lasts. You do not look like a Texas girl in all that snow, you look far too happy :P Still can't wait to see this video of the office chair! I love the look of LPV! And in the snow, it looks fabulous! The photos are great esp the colour contrast of Fifty and all that white! Wow, that snow looks like so much fun! And it definitely looks like Fifty is having a good time! That is so much snow!!!! Holy crap, how do you function with all of that? Well I'm intrigued now. What does Mr. London need to send you in order to fill us in on the rest of your trip? Hmmm, what could it be??? It's got to be a crazy photo, but of what...I can't wait to find out! Your snow is so much prettier than ours! It's so fluffy, abundant...and well, white! Welcome back from your travels!! 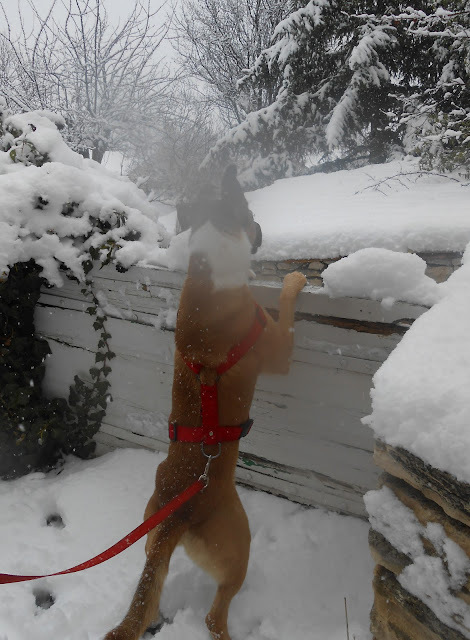 Gorgeous photos of the snow...and also photos that make me jealous that you have a dog! I miss having a dog so much and anyway, how else are you supposed to know if there is a creepy energy coming from a haunted house? wow, look at all that snow!! it sure does make for beautiful pictures though! Your dog is super duper cute..not sure what breed though?! Lovely snowy pictures. Fifty looks like a boxer to me. Have a good one! #1, we have a Gladys in our neighborhood too. High Five. #3, i've had a couple buds pay the hundred bucks or so to get the dna tests, just to have it say their pooch has %10 of 10 different breeds (all the ones that they'd assumed anyway) sooooo... do what you will with that information. What Texas chica can be so dang happy inso much snow?!? Beautiful pics! But brrrrrr! Wow, love all the snow! Fifty is definitely a mix of a rockstar and Superdog. No doubt. This is the kind of snow I wished NYC had last weekend! Yeah so Central Park was blanketed but not in the rest of the city. Fifty looks SO HAPPY in the snow! That snow looks positively glorious! how beautiful! you know, I was actually more moved by all the intimate war memorials in the tiny villages in France than I was when we went to Normandy. We have NO CONCEPT of how devastating WWI was for Europe in America, and those memorials, with far too many names, scream so silently with such pain - I can't even imagine what it must have been like to have woken up, as a young woman in 1919, knowing that the war was over but that so few (if any) of the boys I'd gone to school with would ever be coming home. I love the snow here in Belgium too! First time ever I've experienced so much snow at once! It tickles when it lands on my eyelashes as I walk home and is just so pretty. So what kind of dog is Fifty? He is very cute!